As beautiful as the world is, there is always a part of me that is saddened by the impoverished, less fortunate people and animals I encounter when traveling. It’s not unusual for me to return home carrying various amounts of guilt. I donate to a slew of organizations including the ASPCA, International Rescue Committee, Oxfam, Best Friends Society, Medecins Sans Frontieres and Heifer International. I carry cat and dog food, and am always buying animals food on the go. I was discussing this with my friend Hemang. Hemang is one of the most unique individuals I’ve ever met. He is a financier and decided to move back from New York City to his home, Bombay. He spent a few months at an ashram getting back to the essentials in life. He no longer drinks alcohol or eats meat. Sometimes I wonder if he gets high from too much lemon in his water. His days start with meditation and gratitude. He’s been not only my good friend but a type of shaman to discuss life’s intricacies with. I’m so blessed to have him in my life. We were discussing my frustrations about seeing all the sadness in the world — donating to these non-profits without knowing who exactly is being helped or where the money is going to, except for the 1000 return address labels I have from them all. 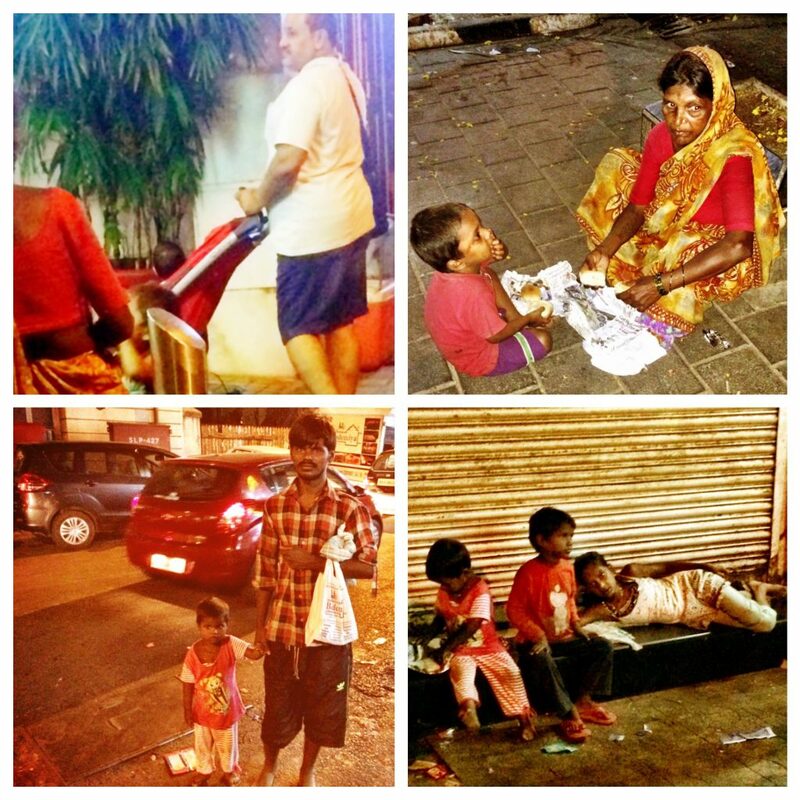 He said “Laurel, if you want to help people, give me some money and I will ensure you it will get put to good use on the streets of Bombay. I will do it all myself.” I used to spend at least $200 a night in New York City going out with friends. I decided to start with that and sent it to Hemang via PayPal immediately. He expected about $20. You used INR 600 today, which using the exchange rate that we used (63.287554) is roughly $9.48. 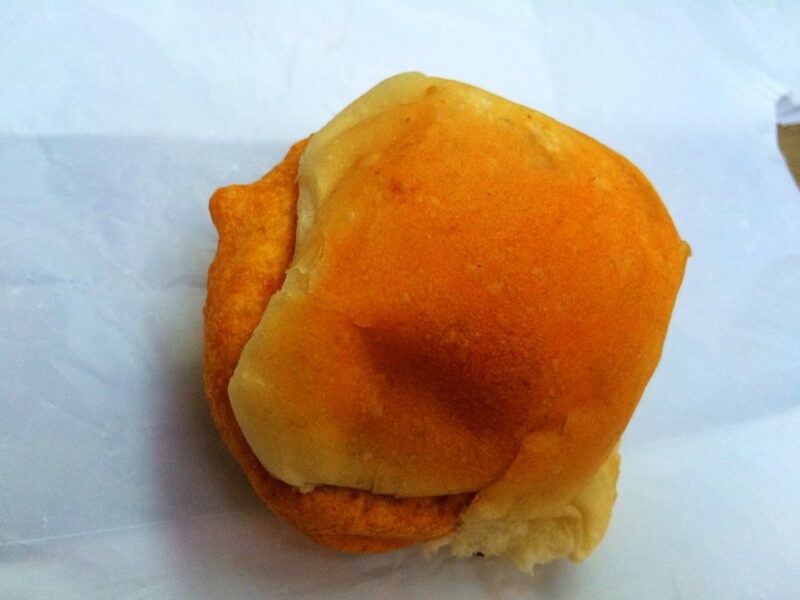 With that I bought 50 vada paos, those Indian burgers that I was referring to. I wanted to count the number of people I distributed them to but I lost count. It’s hard because they all come to you and it’s quite emotional. There were lots of kids but also a few adults. Mostly women but there were a few men too. Most of the adults, in any case, were asking for their children. I don’t know how many you helped feed today, but it was a large number; if I were to guess, 30. And I’ve only used a little less than 5% of what you’ve given. You did good. Thank you so much for allowing me to be the channel! A couple was walking out of the hotel with their child in a stroller. I couldn’t get a good look at the child, but I’d guess he was two years old. And in front of the stroller, running, trying to keep up was a poor kid. He was begging from the couple, but it seemed like he was almost begging from the child in the stroller. I’d guess he was three years old. I can’t get over that “scene.” About ten feet away, a lady who looked like she might be his grandmother kept watch. The poor kid kept running around the family with his hand outstretched. I can’t get the image out of my head. I tried to get a pic. The poor kid who was begging is behind the short pole, in the image. So, while I hadn’t planned a “trip” this evening, I decided for you to go and get some food for that kid. A couple of lanes over, I found a stall selling “omelette pao.” I wasn’t sure if the two of them, the grandmother and the child, were vegetarian but I figured this was a good option. Cost of omelette pao – Rs. 20. (~USD 0.32 using our original exchange rate of 63.287554). For that, you get an omelette sandwiched between two paos – not heavy but a decent meal. I’d be relatively satisfied with that. So you bought one for each of them (one without chillies for the kid) and I headed back, hoping to still find them there. They were still there. I asked them if they ate eggs and they nodded. I gave each of them one packet. To be honest, I wasn’t sure what they were going to do with it because the interaction was so quick and abrupt. I walked away a couple of steps and turned around. They’d already eagerly sat down, then and there, on the sidewalk, to start eating. I can only imagine how hungry they must have been. I’d told you my focus was kids, but tonight I was struck by how quickly that old lady sat down to eat. I’m guessing that when there isn’t enough, which is most of the time, it goes to the kid first. They agreed to a photo. I asked a guy (Ashok) whether the infant on his shoulder had eaten and he said no. I asked him what the infant ate typically and he showed me a small empty milk bottle. That infant was eight months old. So I offered that we go buy milk first but he insisted on milk powder. My infant raising skills is zero but I figured that fresh milk is better than powder. But he said that he would have to boil the milk first which he couldn’t do then. Also, without any refrigeration option, it would spoil quickly and would be wasted. If I bought powder, all he would need to do is find hot water and it would feed the child for a month. So we shuttled around a few stores till we found a chemist which had milk powder for infants. Cost of milk powder: INR 275 (~USD 4.35). According to Ashok, he’s set for a month. (The chemist however seemed to think it would last fifteen days). And you bought him three meals as well, one for him and two for the two ladies we passed. While we were waiting, the infant on his shoulder woke up, looked at me and smiled. And while you were buying him meals, more kids showed up and another lady carrying an infant – five months old. So you bought another milk powder packet. And more meals. And another family showed up – a couple and a child. You bought them meals too. More smiles. In all of these interactions, I’ve noticed that the adult male, if he is with the family, seems to be more withdrawn. Grateful but ashamed. He will let the wife and kids get the meal and be grateful but won’t ask for one for himself. If offered, he will gratefully accept but otherwise is willing to let go. I’m guessing they all share later anyway. But the interaction is perceptibly different. Regardless, you bought all of them meals. They smiled. So far fourteen meals and two milk powder packets. Then I figured I might as well to try and find more kids in the area. I found them at the next corner. One of the mothers (presumably) there was hitting her child – maybe one to two years old. The child cried and she hit…and she cried and she hit. Another frozen scene. You bought all of them meals. They were all very grateful and sent “God’s blessings.” There was an old man standing there with the beggars and asked if it was vegetarian. When I said no, he winced and said he couldn’t eat it. Then, 20 seconds later, while I was finishing distributing, he said, “Screw it, give one to me.” You fed him too. I doubt it was his first time but, if so, you might have converted him yesterday. Smiles. I asked them where I could find more kids and headed in the direction they pointed in. I found another young mother with an eleven-month old child. You bought her a meal and the child another milk powder packet. Ashok was back there hanging out with a kid that had come earlier. He agreed to a photo. He said, on average, he ate two out of three meals and I’m guessing only lunch and dinner count as meals. He tries to work but only gets part-time work. I asked him where I could find more kids and he said his “neighbor” on the street had a young child as well. You bought that child a milk powder packet as well. So, in all, 30 Omelette Paos, one Bhurji Pao, four milk powder packets. Roughly 28 individuals and roughly 28 smiles. Make that 32 individuals if you count the infants, most of whom were sleeping. Total INR 1,725 i.e. USD 27.27 today. To date, we’ve only spent 23.1% of what you’d given originally. A. When you bought the fourth milk powder packet, the chemist suggested politely that I might consider opening the packets and giving it to them, so that they wouldn’t resell it. I don’t think they’re going to resell it. That wasn’t my read. And if they do – so be it. I’d do it again. I see reason to do it in every instance that there is a positive probability (>0) that the infant might get it. Again, my read is all of it will go to the infants. B. Each egg costs the vendor INR five. He claims he nets (income) INR 200-400 a night. He works seven days a week from 6 pm – 1 am. I didn’t ask him if he has a second job but he didn’t mention one. That’s INR 6,000-12,000 a month (USD 94.81-USD 189.61). He says he loses quite a bit because cops come and take food (for free) from him. He promised me that he’d make me count his earnings one night if I stood next to him the whole time. Yet he offered you a very slight discount at the end (which you refused) and was straightforward enough to let his customers know what their waiting time was likely to be (since you were buying in large quantity) and sent them to his competitor if they were in a hurry. A competitor, who he claimed had set up an omelette pao business to drive him out. C. In all of this, I realized all I’d eaten was one samosa pao. And I’d barely had any lunch. Yet I wasn’t hungry. Funny how that works. D. If you give when you’re most in need of receiving, wonderful things seem to happen. I always learn a lot from these interactions. Someday, hopefully, I’ll take you on one “live.” Also the area I was in tonight has a great (kebab, kathi) roll place that is an institution that we must go to. Should you visit Bombay again. 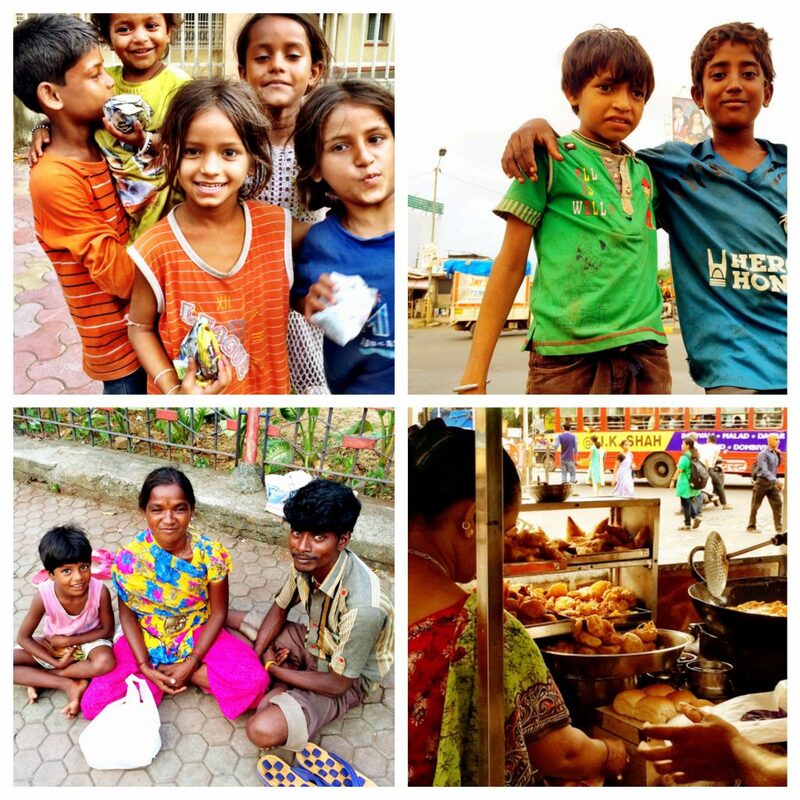 Thank you for doing this – H.
This entry was posted in The Real Dirt, Travels and tagged Bombay, dollars, Donating, India, Non-profits, poverty, rupees, smiles by laurel. Bookmark the permalink. Beautiful, at the end of the holiday season I fill a box with all sorts of different toys for young kids that I’ve purchased at 90% off. And around my neighborhood there are a lot of illegal workers doing jobs and houses and working in Gardens . I also see many young mothers walking up and down the hills around where I live as they have just spent the day cleaning someone’s home before taking a bus back to where they live, probably 10 in a one bedroom apartment. I love pulling up next to them and offering them items their faces just light up . This is what gets me the most enjoyment in my life is making sure the less fortunate are surprised by kindness from strangers, everyone deserves a meal a coat a pair of shoes whatever it may be. If only everybody could do just a little something. But I love this story.